The seemingly grumpy man in this picture is nothing short of a legendary figure, in Contra Costa. And he is, unlike the photograph would lead you to believe, a cheerful, lively, 78 (seventy-eight) years old soccer player. 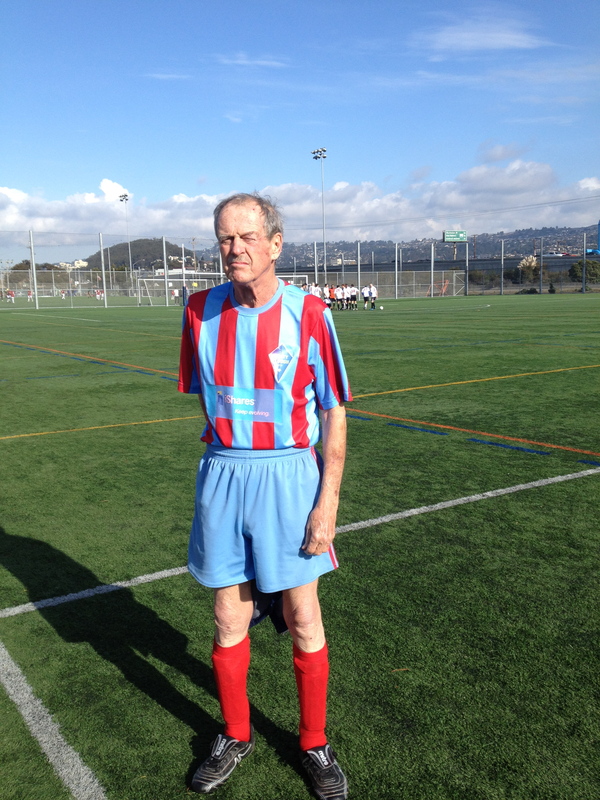 He plays for, appropriately enough, the Rusty Plough, in the EBSSL over 40 league. This is only the last of his innumerable accomplishments. Art O’ Connor was born in 1933 in England (which is quite a feat per se…). When everyone was cheering for the unconquerable Bolton Wanderers and the unbeatable West Bromwich Albion, he picked the proud but flawed Everton. And he is still on their side. In 1949 he boarded on a ship, and he traveled over the world. Mostly, in Asia. In 1957 he rejoined his family which had, meanwhile, moved to California (another remarkable endeavor, the land of the quakes being quite a challenge for a young man). Art became an American citizen shortly after moving to the USA, in 1957. His father wanted him drafted so that he could be thoroughly American, but he did not like the idea. Somehow, his wish was granted, and he escaped the Indocina and Vietnam wars (icing on the cake?). He loved cricket, (European) football was his second love. Here ends the verified story, and Art’s life veers on the hazy. It is a mistery how and where he learned to play football: rumor has it that he learned the art of kicking around balls while browsing the oceans, as unbelievable as it sounds. At every port he probably had a woman and a football tournament waiting for him, so that he could sharpen his renown dancing and tackling skills. Similarly, where he collected all the folktales he loves to tell remains undetermined. It is a known fact, however, that he finally settled down in the Contra Costa, at East Oakland, and at some point of this invaluable trajectory he had his fateful encounter: the Starry Plough pub located in Berkeley. No record or archive, unfortunately, tells us why he stuck around and how the almighty football team he is still steering came to life. Possibly, after an out of the ordinary tango and a similarly unparalleled keg of beer, he decided to spread over the wretched of the East Bay his playing Word. And the legend was born. During the annual Christmas party, which is now in its 12th edition, his faithful followers (among whom I am honored to be) annually award the acclaimed and glamorous “Art O’ Connor Award” to the “Plough” player who best embodies what Art stands for: hard work, resiliency, and a stylish swing at the ball (or so I think: when it comes to Art’s business, things get never quite clarified). Art is the main reason why a bunch of castaways gather together any given Wednesday night to kick some balls, and on Sunday go on to collect bruises and black-and-blue marks. No Art, no party. I came across this when I googled Art – just to see how he and the guys are doing. Great piece! Is there any news recently of Art and any other old timers!?! last time I saw Art was in 2012, then I left the Bay Area. I’ll be there over Thanksgiving, I’ll try to find out how he’s doing and get back to you.